say thank you and plan for the future. Thanks to our supporters, SPOHP has had one of its most productive years yet. We want to take a step back to reflect on some of this year’s greatest hits. But SPOHP never rests! We have a busy year ahead. Let’s also take a look at some of the many programs and events lined up for this summer. 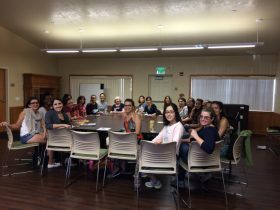 Welcome to SPOHP’s 2017 summer newsletter! 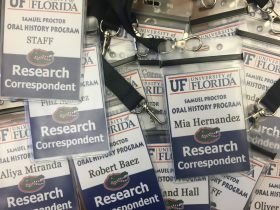 The mission of the Samuel Proctor Oral History Program at the University of Florida is to gather preserve and promote living history for future generations of students, scholars, and inquiring minds. To fulfill our mission, we emphasize three themes: experiential learning, civic engagement, and digital humanities production. As a history professor at the University of Florida, I love books, classrooms, and even dusty archives [sneeze!]. However, experience has taught me the humbling truth that sometimes the most transformative learning experiences happen outside of the lecture hall and the campus. SPOHP specializes in teaching students how to work and learn in spaces far away from the normal “comfort zones” we too often settle down in. Equally important, Proctor Program staff guide our students through the process of transforming the interviews they gather in the field into digital audio podcasts, senior honors theses, dissertations, documentaries, and other formats that are now regularly aired in K-12 classrooms, museums, community organizing workshops, radio stations and other educational platforms. Your support makes it possible for the Proctor Program to amplify the remarkable stories told by our narrators! SPOHP alumni tell us that these learning experiences are life-changing. This week, I received an email from a Proctor Program alumnus who told me: “as a former graduate student at UF, I can attest to the program’s transformative influence – it catalyzed my commitment to using innovative research techniques and progressive pedagogical models in the furtherance of social justice.” This alumnus is now a successful teacher at one of the highest-ranked schools in the United States. Of course, none of this is possible without your support! The great majority of SPOHP’s field work initiatives are funded by private donations; no donation is too small! Your support helps ensure that the Proctor Program is able to cover the travel, lodging, and equipment costs of our students as they embark on the field work opportunities you will read about in this newsletter. Above all, I hope that you will enjoy this update on SPOHP’s work, and I welcome the opportunity to answer any questions you may have about the Samuel Proctor Oral History Program. Thanks to our donors, 2016-2017 was our year. We Sent a Team of Students to the 2017 Presidential Inauguration and the Women’s March on Washington! 19 Students, over 150 interviews. 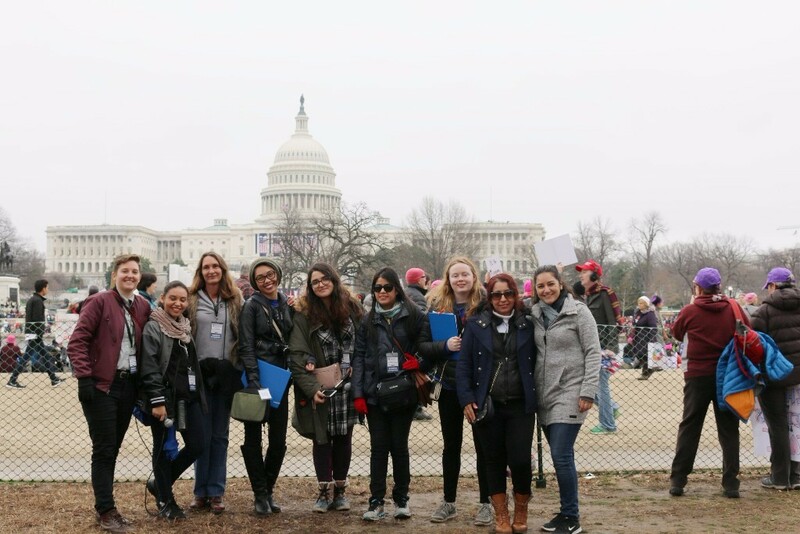 This Experiential Learning Oral History Project sent out a team of students to document the voices of attendees of the 2017 Inauguration and Women’s March on Washington. Over the course of this year SPOHP will begin receiving and archiving interviews conducted at Women’s Marches all over the country. 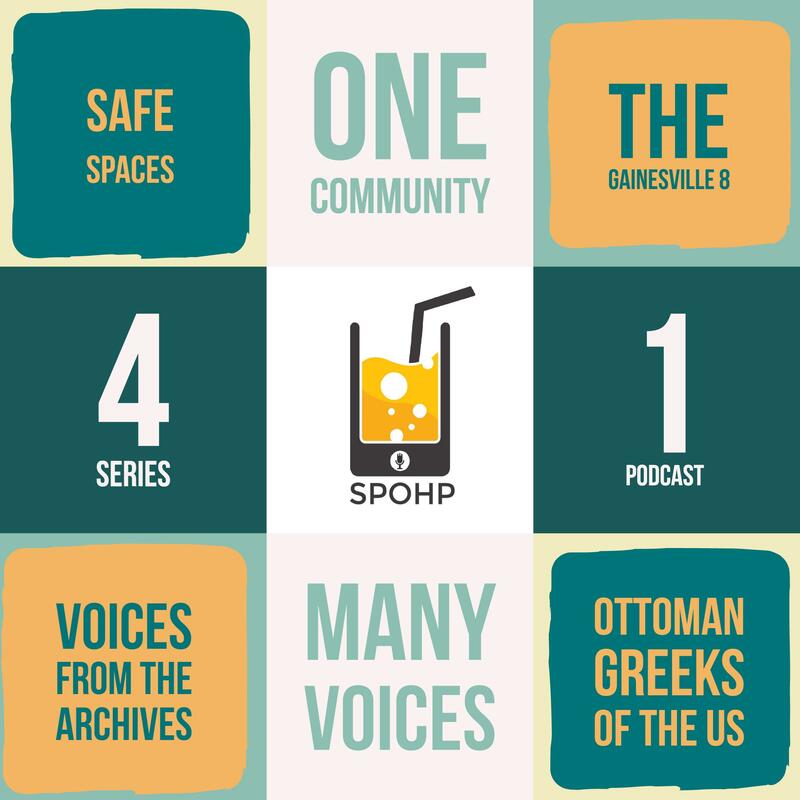 Available on iTunes, SoundCloud or the SPOHP website, the SPOHP Podcast is dedicated to making the stories from our archives as accessible to you as possible. Our interns showcased their final podcast projects at the end of the semester. SPOHP will be uploading these pieces to the UFDC for public access. 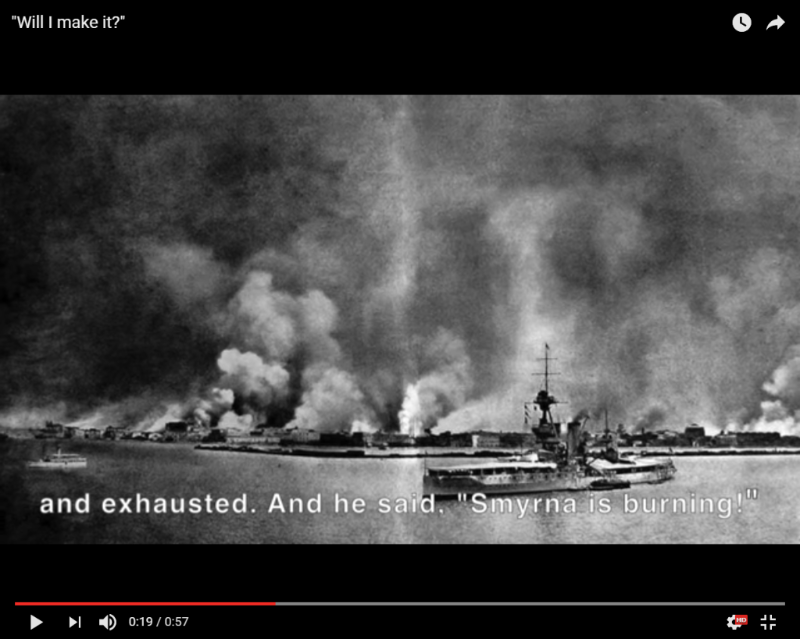 This video is a sample from an Ottoman Greeks of the US Project presentation entitled, Goodbye Virgin Mary: Early 20th Century Memories of Migration from the Ottoman Empire. The sample is from a longer video called, “Will I Make It?” The rest of the video was featured at St. George Greek Orthodox Church in Hollywood, Florida. For more information about the Ottoman Greeks of the US Project please contact the project’s coordinator, George Topalidis at ogus0424@gmail.com. This exhibit is designed to provoke audiences to connect the historical issues of women to issues of the present day (Website). By placing the performance in the context of the exhibition, we will further explore this connection. By illuminating the issues expressed by the women at the March, and telling the story through the eyes of the students who went to the March in context of the exhibit, our project has the potential to create deep resonance and generate discussion between audience and performers. With a professional background in film and theatre directing and producing, Jeffrey holds an MFA in Theater Performance (University of Cincinnati) and an MFA in Theater Directing (University of Victoria). 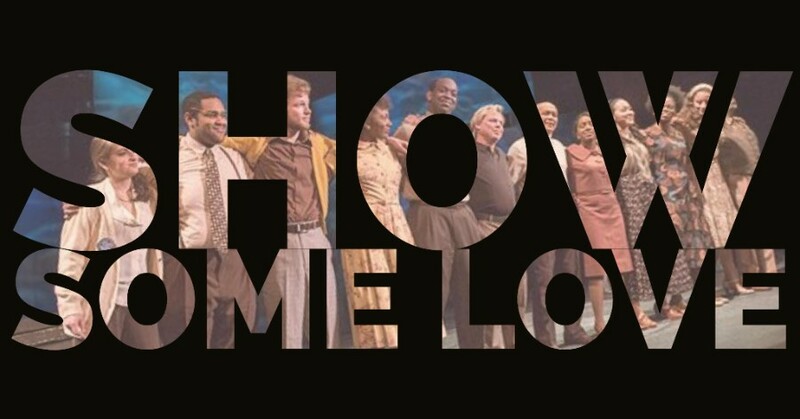 His work at the University of Florida is focused on creating inter-campus and inter-community partnerships to develop theatre-based programming that addresses social issues and community health. A member of the UF Imagining America cohort, Jeffrey specializes in creating site-specific theater and documentary film. 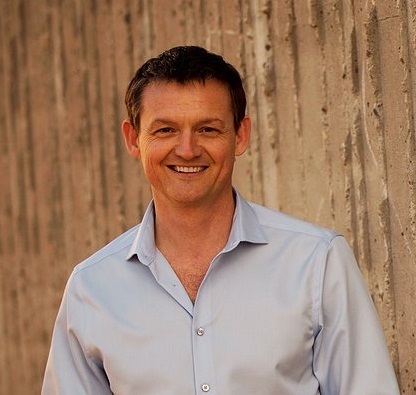 His research focuses on innovatively applying theatre and video to health, social, and educational content in order to engage audience more effectively. The 2017 Mississippi Freedom Summer Research Trip is Underway! 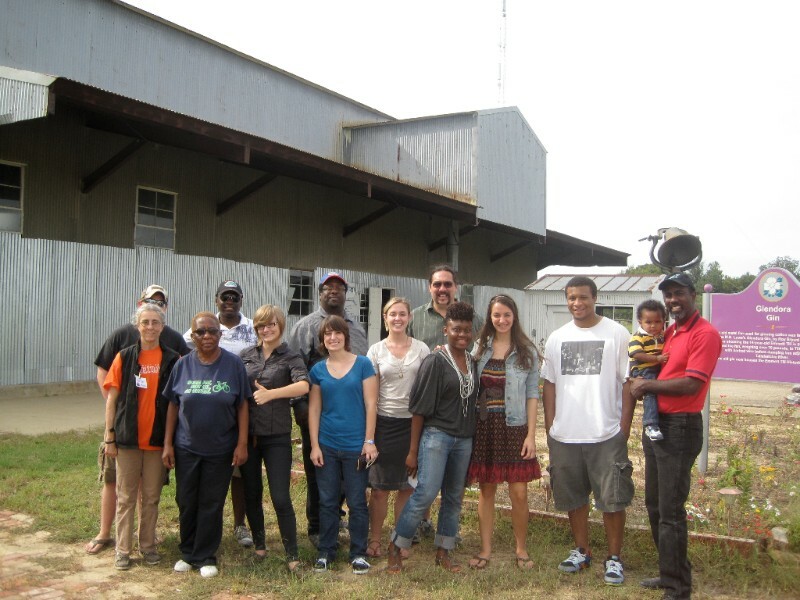 Our Mississippi Freedom Summer team will hit the road for Delta, Mississippi on June 18th. Over the past several years, SPOHP has collected 200+ interviews with members of the Sunflower County Civil Rights Organization. 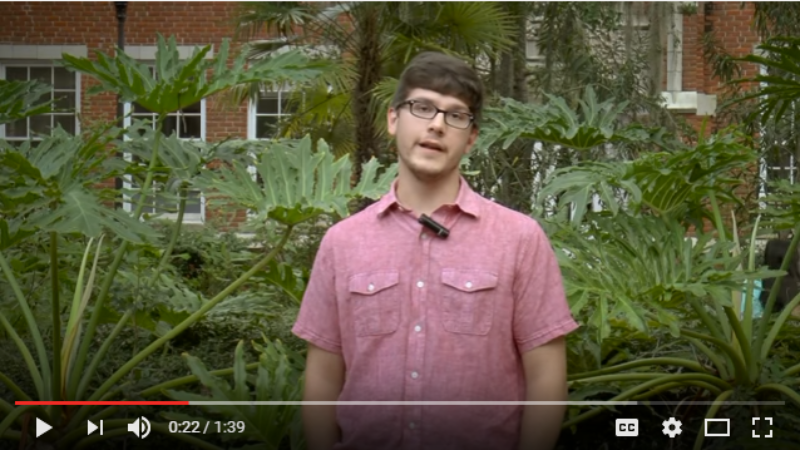 UF students will return to Gainesville and host public programs to discuss what they’ve learned. Many student-participants in the past have incorporated their oral histories into senior theses, dissertations, and conference papers. The goal of all of these symposia is to use the history of the civil rights movement as a starting point to interrogate the world around us today and to think about what still needs to be changed. Learn more about this research project here (PDF). In this video, Patrick Daglaris talks about how the Samuel Proctor Oral History Program has guided his career path. 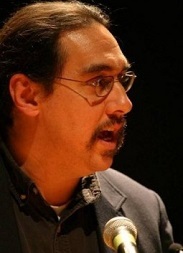 The Sven and Astrid Liljeblad Fund grant will help Dr. Morini to continue his historical ethnographic work with Western Shoshones in Nevada, which is currently focused on telling the stories of individuals whose lives, when described together, help to demonstrate the variety of ways that Shoshone people survived the challenges of the 19th and 20th centuries and worked to create opportunities for future generations. The grant will fund a trip to the National Archives in San Bruno, California, which holds most of the Indian Agency records for Nevada Shoshones from the 19th to the mid-20th centuries, and also a trip to Nevada to share that information with Shoshone community members and to conduct new oral history interviews related to it. The soon-to-be Dr. Dunnavant was awarded the University of California President’s Postdoctoral Fellowship (Fall 2017 – Spring 2018) and the Vanderbilt Academic Pathways Postdoctoral Fellowship (Fall 2018 – Spring 2020). 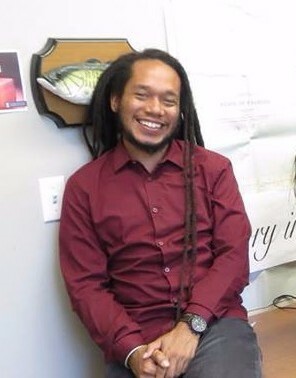 As a UC President’s Fellow, he will be in residence at the UC Santa Cruz Archaeological Research Center, publishing his dissertation research on Ethiopian historical archaeology and developing a new archaeology project that explores the ecology of slavery in the former Danish West Indies (St. Croix). 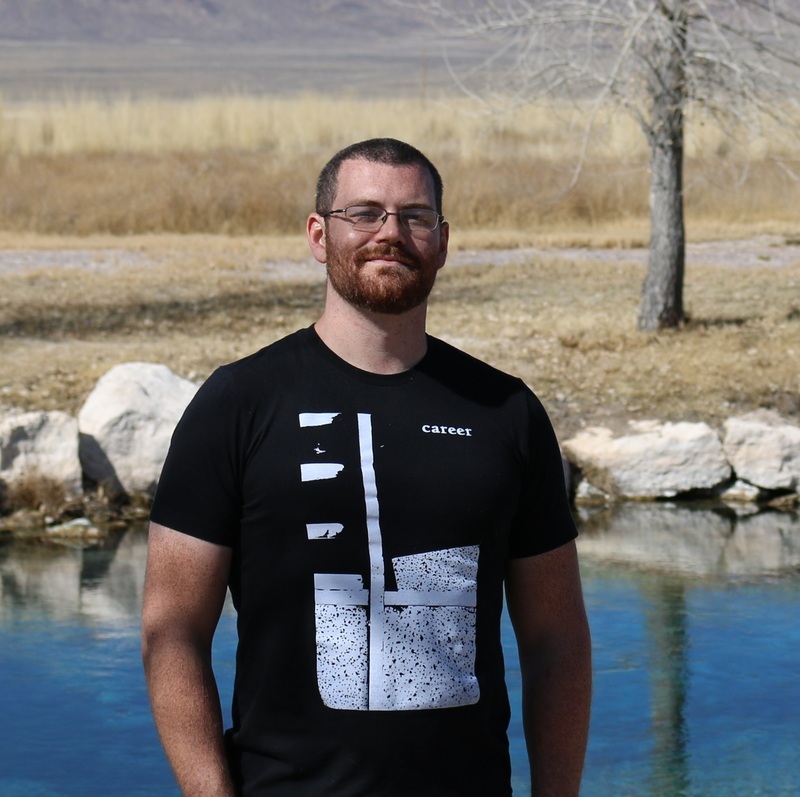 As a Vanderbilt Academic Pathways Fellow, he will continue to develop the geospatial component of his St. Croix research at Vanderbilt University’s Spatial Analysis Research Laboratory (SARL).